For other uses of "Zeppelin", see Zeppelin (disambiguation). 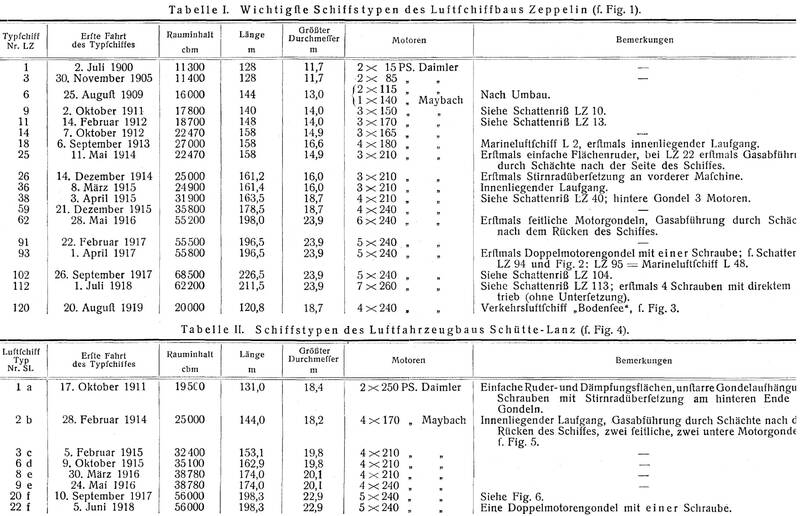 This is a complete list of Zeppelins constructed by the German Zeppelin companies from 1900 until 1938. Other types of rigid airships that are also sometimes referred to as zeppelins are not included. The German Army called its first Zeppelins Z I/II/ ... /XI/XII. During World War I they switched to using the LZ numbers, later adding 30 to obscure the total production. Since 1997, airships of the new type Zeppelin NT have been flying. They are not included here, as they are not Zeppelins in the traditional sense. LZ 1 A Experimental 2 July 1900 Three flights, exceeding speed achieved by La France, dismantled in 1901 due to lack of money for further development. LZ 2 B Experimental 17 January 1906 First taken from hangar on 30 November 1905 but never lifted off from Lake Constanz; took off on second attempt, but damaged beyond repair after emergency landing. LZ 4 C Military (intended) 20 June 1908 Completed a 12-hour flight on 1 July 1908; attempted 24-hour endurance flight on 4 August 1908, but landed near Echterdingen after 12 hours to repair an engine. Destroyed when strong winds broke its moorings. H Ersatz Z I Military 16 January 1913 Destroyed in a forced landing on 19 March 1913. I L 2 Military 9 September 1913 Johannisthal Air Disaster: destroyed by an explosion caused by escaped hydrogen being sucked into an engine compartment during a test flight on 17 October 1913; the entire crew was killed. H Second Ersatz Z I Military 6 June 1913 Damaged beyond repair after a forced landing 13 June 1914. H Z V Military 8 July 1913 Used early in World War I for reconnaissance missions in Western Poland; forced landing due to damage from ground fire after an attack on Mława during the Battle of Tannenberg: crew captured. K Z VI Military 10 November 1913 Carried out the first airship bombing mission of World War 1; on 6 August 1914, bombed raid Liège, dropping artillery shells instead of bombs. The airship's inadequate lift kept it at low altitude so that bullets and shrapnel from defending fire holed the gasbags. The ship limped back to Cologne but had to be set down in a forest near Bonn, completely wrecking it. L Z VII Military 8 January 1914 Limited to a ceiling of around 1,600 m (5,200 ft), on 21 August 1914 Z VII was sent to find the retreating French Army around the Vosges mountains in Alsace, and drop bombs on the camps. After passing through clouds Z VII found itself right above the main army, whose small-arms fire penetrated many gas cells. Leaking heavily, the crew force-landed the airship near St. Quirin, Lorraine. L Z VIII Military 11 May 1914 Under the same orders as Z VII on 21 August 1914, Z VIII engaged the French army while at an altitude of a few hundred feet. According to Lehmann Z VIII received "thousands of bullets and shell splinters", forcing it to drift and make a forced landing in no man's land near Bandonvillers. The crew destroyed all documents and tried to burn the wreck but so little gas remained it would not burn: the airship crew were captured by the French Army. M Z IX military 13 July 1914 Used for reconnaissance missions and bombing in northern France; on 25 August 1914 nine bombs dropped on Antwerp killed or wounded 26 people and damaged a royal palace. The Belgian royal family were in residence and the attack was widely condemned. Destroyed in its hangar at Düsseldorf on 8 October 1914 by bombs dropped by Flt Lt. (later Air Vice Marshal) Reginald Marix, RNAS flying a Sopwith Tabloid . N Z XII (Z 12) 14 December 1914 Z XII made 11 attacks in Northern France and at the Eastern front, dropping a total of 20,000 kilograms (44,000 lb) of bombs; by the summer of 1915 Z 12 had dropped around 9,000 kg (20,000 lb) of bombs on the Warsaw to Petrograd trunk railway line between the stations at Malkina and Białystok. One flight carried a load of 3,000 kg (6,600 lb). Decommissioned on 8 August 1917. M L 4 18 August 1914 Flew 11 reconnaissance missions over the North Sea, participated in the first raid over England on 20 January 1915. Forced landing in Blavandshuk on 17 February 1915 during a storm; 11 of the crew were interned, with four members lost when the airship was subsequently carried out to sea. M L 5 22 September 1914 Flew 47 reconnaissance missions over the North Sea and Baltic Sea; proved especially useful in discovering enemy mines. Two attack missions, dropping 700 kg (1,500 lb) bombs. Damaged beyond repair by Russian air defences on 7 August 1915. M Z X 13 October 1914 Two attacks on Calais and Paris, dropping 1,800 kg (4,000 lb) of bombs; on the way back Z X was damaged by enemy fire and dismantled after a forced landing at St. Quentin. M L 6 3 November 1914 Took part in German defence during the Cuxhaven Raid on 25 December 1914, unsuccessfully attacking HMS Empress; 36 reconnaissance missions around North Sea, including marking of mine fields; one successful raid on England, dropping 700 kg (1,500 lb) of bombs. Caught fire during inflation in its hangar at Fuhlsbüttel and destroyed together with LZ 36 on 16 September 1916. M L 8 17 December 1914 Used for reconnaissance missions along the Western front. Brought down by anti-aircraft fire at Tirlemont on 5 March 1915. The crew of 21 were all killed. M 6 January 1915 Carried out two raids on the Eastern front, dropping 1,110 kg (2,450 lb) of bombs. Heavily damaged by enemy fire on 21 June 1915 and destroyed by fire following a forced landing near Insterburg. M 11 January 1915 Two raids on Paris and Poperinghe (Belgium), dropping 2,420 kg (5,340 lb) of bombs; forced landing near Aeltre (Belgium) due to damage by enemy fire, then destroyed by a storm. 74 reconnaissance missions in the North Sea; four raids on England dropping a total of 5,683 kg (12,529 lb) of bombs; several attacks on British submarines. Burnt out in its hangar on 16 September 1916 together with LZ 31. P LZ 38 3 April 1915 Carried out the first bombing raid on London on 31 May 1915 killing 7 and injuring 35 people (with material damage assessed at £18,596), five successful raids on Ipswich, Ramsgate, Southend (twice) and London, dropping a total of 8,360 kg (18,430 lb) of bombs. Destroyed by British bombing in its hangar at Evere on 7 June 1915. O LZ 39 24 April 1915 Three raids on the western, later two on the eastern front, dropping a total of 4,184 kg (9,224 lb) of bombs. On 17 December 1915, captained by Dr. Lempertz, LZ 39 was hit several times by shrapnel during an attack on Rovno. All rear gas cells were punctured and the front engine car was hit and later fell off. The crew abandoned the now-overstressed control cabin, dropped ballast and shifted loads to rebalance the ship and used an emergency control station in the rear to limp back to Germany. Upon forced landing the ship collapsed because material for repair and the supply of gas needed to refill the cells were not available. P L 10 13 May 1915 8 reconnaissance missions around the North Sea; 5 attacks on England dropping a total of 9,900 kg (21,800 lb) of bombs. Destroyed in a thunderstorm on 3 September 1915 near Cuxhaven killing 19 crew members. P LZ 72 15 June 1915 Only used as a school ship, as airframe metal was of poor quality; decommissioned in February 1917. P L 12 21 June 1915 5 reconnaissance missions; after being damaged by A.A. fire during a raid in which it bombed Dover came down in the English Channel. Towed back to Ostend on 10 August 1915 but caught fire during salvage operation. P LZ 74 8 July 1915 Two attacks on England dropping a total of 3,500 kg (7,700 lb) of bombs; wrecked when it flew into a mountain in the Schnee Eifel on 8 October 1915. P L 14 9 August 1915 Most successful German Navy airship; 42 reconnaissance missions; 17 attacks on Britain dropping a total of 22,045 kg (48,601 lb) of bombs; taken out of service during 1917 and 1918. Destroyed by its crew on 23 June 1919. P LZ 77 24 August 1915 6 attacks on England and France dropping a total of 12,610 kg (27,800 lb) of bombs. Destroyed by enemy fire on 21 February 1916 in the Battle of Verdun, killing the crew of 15. Reports at the time indicated LZ 77 had searchlights, eight machine guns, two so-called 'revolver' guns in the top lookout post, was accompanied by fixed-wing aircraft and at least one other Zeppelin and had orders to bomb the nearby railway lines. P L 15 9 September 1915 8 reconnaissance missions; 3 attacks on England dropping a total of 5,780 kg (12,740 lb) of bombs. Damaged by ground fire from Dartford AA battery during a raid on London on 1 April 1916, it came down at Kentish Knock Deep in the Thames estuary. 1 crew member was killed, the other 17 were taken prisoner. P LZ 79 2 August 1915 Dropped a total of 4,440 kg (9,790 lb) of bombs in two attacks on Brest-Litovsk and Kovel and one attack on Paris on 30 January 1916; hit by French fire and damaged beyond repair in forced landing near Ath. P L 16 23 September 1915 44 reconnaissance missions; 12 attacks on England dropping a total of 18,048 kg (39,789 lb) of bombs; delivered supplies to German isles in winter 1916. Damaged beyond repair during a training mission at Nordholz Naval Airbase on 19 October 1917. P LZ 81 7 October 1915 Used at the South-Eastern and the Western Front; transported a diplomatic commission to Sofia on 9 November 1915; one attack on Étaples (France) and two attacks on Bucharest, dropping a total of 4,513 kg (9,949 lb) of bombs; brought down by ground fire near Turnovo (Bulgaria) on 27 September 1916. P L 17 20 October 1915 27 reconnaissance missions; 9 attacks on England dropping a total of 10,724 kg (23,642 lb) bombs. Destroyed in its hangar at Tondern on 28 December 1916 when LZ 69 caught fire. Raided England on 31 January 1916, dropping a total of 1,600 kg (3,500 lb) of bombs. On 2 February 1916 after a raid on England with three engines failing, it came under Dutch fire and sank in the North Sea, drowning all crew members as nearby English fishing trawler "King Stephen" refused any help to them. In the last hours Kapitan-Leutnant Loewe and his crew dropped into the sea their last messages, which washed up six months later in Sweden. On 23 April 1916 Torpedo boat G41 attacked and sank the King Stephen, taking its crew prisoner. P LZ 85 12 September 1915 6 attacks dropping a total of 14,200 kg (31,300 lb) of bombs on Dünaburg (Latvia), Minsk, the railroads of Riga, and Saloniki (twice); damaged by fire from the battleship HMS Agamemnon on 5 May 1916, it came down in the Vardar marshes. The crew of 12 were captured. P LZ 86 10 October 1915 7 attacks dropping a total of 14,800 kg (32,600 lb) of bombs along the Eastern and South-Eastern front; crashed on 5 September 1916 at Temesvar, killing nine of the crew. P LZ 87 6 December 1915 2 attacks on Ramsgate and Margate dropping a total 3,000 kg (6,600 lb) of bombs; in July 1916 handed to the German Navy; 16 reconnaissance missions around the Baltic Sea; later used as a school ship. Decommissioned in July 1917. P LZ 88 14 November 1915 14 reconnaissance missions; 3 attacks dropping a total 4,249 kg (9,367 lb) of bombs along the Western Front; in January 1917 handed to the German Navy who used it for experimental purposes. Decommissioned in September 1917. 6 reconnaissance missions; 2 attacks on England dropping a total 2,864 kilograms (6,314 lb) bombs; ran out of fuel after raiding Scotland on 3 May 1916, drifted and stranded near Stavanger (Norway). The crew destroyed the airship. 16 were captured, 3 died. Kapitänleutnant Stabbert escaped six months later. P LZ 90 1 January 1916 4 attacks on Bar-le-Duc, Norwich, London and Étaples, dropping a total of 8,860 kilograms (19,530 lb) of bombs; on 7 November 1916 broke loose in a storm and blown out to sea and was never seen again. Q L 21 10 January 1916 17 reconnaissance missions; 10 attacks on England dropping a total 14,442 kilograms (31,839 lb) of bombs. Intercepted and destroyed by Flight–Lieutenant Egbert Cadbury, flying BE 2C, No. 8265, Flight Sub–Lieutenant Gerard William Reginald Fane, flying RAF BE 2C No. 8421 and Flight Sub–Lieutenant Edward Laston Pulling, flying BE 2C, No. 8626, firing phosphor rounds. L 21 fell into the sea about eight miles east of Lowestoft on 28 November 1916. There were no survivors. R L 30 28 May 1916 First of the Type R "Super-Zeppelin" class, it had a volume of 55,200 m3. 10 raids on England dropping a total of 23,305 kilograms (51,379 lb) of bombs; 31 reconnaissance missions above the North and Baltic Seas and at the Eastern Front; retired on 17 November 1917 and laid up at Seerappen. In 1920 ordered to be transferred to Belgium as part of war reparations, where it was dismantled. Some components, including an engine car, are preserved at the Royal Army and Military History Museum, Brussels. P LZ 93 23 February 1916 Three attacks on Dunkirk, Mardick and Harwich, dropping 3,240 kilograms (7,140 lb) bombs. Decommissioned in 1917. Q LZ 95 1 February 1916 Destroyed by French anti-aircraft fire on 21 February 1916 during an attempted attack on Vitry-le-François. 51 reconnaissance missions; 3 attacks on England dropping a total of 5,254 kg (11,583 lb) of bombs; destroyed on 21 August 1917 by 2nd Lt Bernard A. Smart flying a Sopwith Pup launched from a platform on the cruiser HMS Yarmouth. Smart later led the Tondern raid which destroyed LZ 99 & LZ 108. Q LZ 97 4 April 1916 4 attacks on London (twice), Boulogne and, later, Bucharest, dropping a total of 5,760 kilograms (12,700 lb) of bombs, plus several unsuccessful flights due to bad weather. Decommissioned on 5 July 1917. Q LZ 98 28 April 1916 One attack on London dropping 1,513 kilograms (3,336 lb) bombs, plus several flights aborted due to bad weather; handed to the German Navy in November 1916; 15 reconnaissance missions around the Baltic Sea. Decommissioned in August 1917. Q L 24 20 May 1916 19 reconnaissance missions around the North Sea; 4 raids on England dropping a total of 8,510 kilograms (18,760 lb) f bombs; crashed into a wall while being taken into its hangar on 28 December 1916 and burned out together with LZ 53. Q LZ 101 29 June 1916 Stationed in Yambol (Bulgaria); 7 attacks dropping a total of 11,934 kg (26,310 lb) of bombs on Bucharest, Ciulniţa, Feteşti, Galaţi, Odessa, Mytilene, Iaşi and Mudros. Dismantled in September 1917. R L 31 12 July 1916 One important reconnaissance mission in fleet operation against Sunderland; 6 attacks on England dropping a total of 19,411 kilograms (42,794 lb) of bombs; with LZ 74, LZ 76 and LZ 78 part of Zeppelin raid on night of 23 September 1916; intercepted and destroyed by British fighter pilot Lt V Tempest on 2 October 1916 near Potters Bar, north of London, while commanded by the leading airship commander of the time, Kapitän Leutnant Heinrich Mathy, who died with his entire crew after jumping from the flaming Zeppelin. The crew were originally buried at Potters Bar but were later exhumed and reburied at Cannock Chase. R L 32 4 August 1916 Three attacks on England dropping a total of 6,860 kilograms (15,120 lb)of bombs; commanded by Kapitan-Leutnant Werner Petersen, with LZ 72, LZ 76 and LZ 78 part of Zeppelin raid on the night of 23 September 1916; intercepted and destroyed by 2nd Lt Frederick Sowrey, of 39 Home Defence Squadron, in a Royal Aircraft Factory BE.2c on 24 September 1916 near Great Burstead, Essex, all the crew dying. The crew's bodies were buried at Great Burstead, then in 1966 exhumed and reburied at Cannock Chase. Q LZ 107 16 October 1916 One attack on Boulogne, France, dropping 1,440 kilograms (3,170 lb) of bombs (several other raids being cancelled or aborted). Decommissioned in July 1917. R L 34 22 September 1916 Three reconnaissance missions; two attacks on England dropping a total of 3,890 kg (8,580 lb) of bombs; took part in the Zeppelin raid which also involved the L 31, L 32 and L 33 on the night of 23 September 1916, and was the only Zeppelin that survived the raid; intercepted and destroyed by British fighter pilot 2nd Lt Ian Pyott in BE2c no. 2738 off Hartlepool on 27 November 1916. R L 41 15 January 1917 15 reconnaissance missions around the North Sea; four attacks on England dropping a totalof 6,567 kilograms (14,478 lb)of bombs; used as a school ship from 11 December 1917. Destroyed by its crew on 23 June 1919. R L 35 20 October 1916 13 reconnaissance missions around the North and Baltic Sea; three attacks on England dropping a total of 4,284 kilograms (9,445 lb) of bombs; decommissioned in September 1918. Q LZ 111 20 December 1916 Not used in the German Army and transferred to Navy in May 1917; 7 reconnaissance missions around the Baltic Sea. Decommissioned on 10 August 1917. R L 36 1 November 1916 20 flights around the North Sea and England, including four reconnaissance missions; damaged during landing in fog at Rehben-an-der-Aller on 7 February 1917 and decommissioned. R LZ 113 22 February 1917 15 reconnaissance missions around the Eastern Front and the Baltic Sea; three attacks dropping a total of 6,000 kilograms (13,000 lb) of bombs. In 1920 ordered to be transferred to France as part of war reparations. R L 45 12 April 1917 12 reconnaissance missions around the North Sea; 3 attacks on England dropping a total of 4,700 kilograms (10,400 lb) of bombs. Ran out of fuel on 20 October 1917 and destroyed in forced landing near Sisteron, France, the crew being taken captive. R L 39 11 December 1916 Two reconnaissance missions around the North Sea; one attack on England dropping 300 kg bombs, and on return destroyed by French flak near Compiègne on 17 March 1917. R L 47 11 May 1917 18 reconnaissance missions and three attacks dropping a total of 3,240 kilograms (7,140 lb) of bombs around the North Sea and England. On 5 January 1918, a giant explosion in the air base in Ahlhorn destroyed four Zeppelins (including L 47) and one non-Zeppelin built airship, housed in one adjacent hangar and two 0.5 mi (0.80 km) away. R L 40 3 January 1917 7 reconnaissance missions; 2 attacks on England, dropping a total of 3,105 kilograms (6,845 lb) of bombs. Damaged beyond repair while landing on 16 June 1917 in Nordholz. R L 50 9 June 1917 5 reconnaissance missions around the North Sea; two attacks on England dropping a total of 4,135 kilograms (9,116 lb) of bombs. Ran out of fuel on 20 October 1917 and, after the control car had been torn off as a result of an attempt to crash the airship to prevent it falling into enemy hands near Danmartin, it was blown over the Mediterranean with five crew members still on board. R LZ 120 31 January 1917 17 reconnaissance missions and 3 attacks dropping 11,250 kilograms (24,800 lb) of bombs around the Eastern Front and the Baltic Sea. Retired on 8 October 1917; in 1920 ordered to be transferred to Italy as war reparations, where it broke apart one year later while gas was removed. S L 42 21 February 1917 First of the Height-Climber S class, which had a lightened structure to improve maximum altitude. . 20 reconnaissance missions; 4 attacks on England dropping a total of 6,030 kilograms (13,290 lb) of bombs; used as a school ship from 6 June 1918. Destroyed by its crew on 23 June 1919. S L 43 6 March 1917 6 reconnaissance missions; one attack on English docks, dropping 1,850 kilograms (4,080 lb) of bombs. Shot down by British fighter aircraft on 14 June 1917 during reconnaissance mission. T L 44 1 April 1917 8 reconnaissance missions; 4 attacks on England and Royal Navy units. Driven south to France by a heavy storm, it was shot down over Lunéville on 20 October 1917. T L 46 24 April 1917 19 reconnaissance missions around the North Sea; 3 raids on England dropping a total of 5,700 kilograms (12,600 lb) of bombs. Destroyed in the Ahlhorn explosion. U L 48 22 May 1917 Several of the LZ 41 crew transferred to the L 48; one reconnaissance mission successful. As part of an attempted attack on London with 3 others became lost and was then intercepted and destroyed by British fighters over sea near Great Yarmouth on 17 June 1917 crashing near Leiston. Three survivors; crew buried at Theberton, Suffolk, later to be exhumed and reburied at Cannock Chase. Two reconnaissance missions around the North Sea; one raid on England dropping 2,100 kilograms (4,600 lb) of bombs; while returning, forced to land near Bourbonne-les-Bains on 20 October 1917 and captured almost undamaged by French forces. The design of LZ 96 influenced the design of the first American rigid airship, the USS Shenandoah (ZR-1) and the British R38. U L 51 6 June 1917 3 reconnaissance missions; one raid on the English coast, dropping 280 kg bombs. Destroyed in the Ahlhorn explosion. U L 52 14 July 1917 20 reconnaissance missions; accidentally taken above London by an unexpected storm during a raid, it dropped 2,020 kilograms (4,450 lb) of bombs there. Destroyed by its crew on 23 June 1919. V L 53 8 August 1917 19 reconnaissance missions; 4 attacks on England, dropping a total of 11,930 kilograms (26,300 lb) of bombs. Intercepted and destroyed by a Sopwith Camel flown by Lt Culley RAF, who took off from a lighter towed by the destroyer HMS Redoubt, on 11 August 1918. LZ 100 was the last zeppelin destroyed in the war. V L 55 1 September 1917 Two attacks dropping a total of 5,450 kilograms (12,020 lb) of bombs. Heavily damaged in the second one on 19 October 1917, it drifted behind western front and rose to a Zeppelin all-time record altitude of 7,600 metres (24,900 ft) to escape; then dismantled upon forced landing. W L 57 26 September 1917 Not used in combat. Intended for use in Africa. Damaged beyond repair by heavy wind on 8 October 1917. V L 56 24 September 1917 17 reconnaissance missions; participated in the last raid on England on 6 August 1918. Destroyed by its crew on 23 June 1919. Known as das Afrika-Schiff, stationed in Yambol (Bulgaria); L 59 started out on a mission to resupply German troops in German East Africa, but turned back upon (false) reports of a German surrender; nevertheless, the ship broke a long-distance flight record (6,757 kilometres (4,199 mi) in 95 hours and 5 minutes). One attack on Naples, Italy dropping 6,400 kilograms (14,100 lb) of bombs. Caught fire during a raid on Malta on 7 April 1918 for unknown reasons. V L 58 29 October 1917 Two reconnaissance missions; destroyed in the Ahlhorn explosion. V L 61 12 December 1917 9 reconnaissance missions; two attacks on England dropping a total of 4,500 kilograms (9,900 lb) of bombs; in 1920 ordered to be transferred to Italy as war reparations. V L 62 19 January 1918 Two reconnaissance missions; two attacks on England dropping a total of 5,923 kilograms (13,058 lb) of bombs; on the raid on 12/13 April 1918 her gunners managed to damage and drive away an attacking airplane, the only known instance of this happening. Crashed north of Helgoland on 10 May 1918: shot down by Felixstowe F2A flying-boat N4291, flown by Capt T.C. Pattinson and Capt T.H. Munday. V L 60 18 December 1917 11 reconnaissance missions; one attack on England dropping 3,120 kg of bombs; destroyed together with LZ 99 when seven RNAS Sopwith Camel fighters, launched from the aircraft carrier HMS Furious, bombed the Toska hangar at Tønder, Denmark. V L 64 11 March 1918 13 reconnaissance missions over the North Sea; with LZ 108, LZ 106, LZ 107, and LZ 110 raided north of England dropping 2800 kg in bombs. In 1920 transferred to Britain as war reparations. Scrapped at short notice when hangar required for the damaged R36. V L 63 4 March 1918 Dropped a total of 8,915 kg (19,654 lb) of bombs in three attacks on England, including participation in the last raid on England on 6 August 1918. Destroyed by its crew on 23 June 1919. V L 65 17 April 1918 Participated in last raid on England on 6 August 1918. Destroyed by its crew on 23 June 1919. X L 70 1 July 1918 Directed last raid on England on 6 August 1918, with KK Peter Strasser, Commander of the Navy Airship Department on board; intercepted and destroyed over North Sea by British de Havilland DH-4 flown by Major Egbert Cadbury with Captain Robert Leckie (later Air Vice-Marshal) as gunner. Both these men shot down two Zeppelins: prior to L 70, Cadbury had downed L 21 and Leckie, L 22. X L 71 29 July 1918 Not used in war; in 1920 ordered to be transferred to Great Britain in the context of war reparations. Scrapped at short notice when hangar required for the damaged R36. X L 72; in France: Dixmude 9 February 1920 Not delivered because war ended; in 1920 ordered to be transferred to France in the context of war reparations and handed over on 9 July 1920 and renamed Dixmude. Made then world record duration flight of 118 hours. Exploded off the coast of Sicily during a thunderstorm in December 1923, killing all aboard. This September 1917 group photograph shows these Navy Zeppelin captains: Manger (L 41), von Freudenreich (L 47), Schwonder (L 50), Prölss (L 53), Bockholt (L 57), Peter Strasser (FdL – Führer der Luftschiffe), Gayer (L 49), Stabbert (L 44), Ehrlich (L 35), Dietrich (L 42), Hollender (L 46), Dose (L 51) and Friemel (L 52). LZ 127 Graf Zeppelin civilian 18 September 1928 Most successful airship in history; regular flights to North and South America; world tour in 1929, Arctic trip in 1931. Dismantled in 1940 upon order of Hermann Göring. Hindenburg (first Hindenburg class airship) civilian 4 March 1936 Intended for filling with helium gas instead of flammable hydrogen, which was, however, refused to be provided to Germany mainly by the US. Regular voyages to North and South America. Destroyed in Hindenburg disaster on 6 May 1937. Graf Zeppelin II (second Hindenburg class airship) civilian 14 September 1938 Total 30 flights (36,550 km, 409 hrs), mainly flight testing but also electronic warfare and radio interception over English coast and Polish/German border. Modified for helium, but none provided by US. Last flight 20 August 1939. Dismantled in 1940 upon order of Hermann Göring. ↑ 1.0 1.1 Robinson 1973, p.330. ↑ 2.0 2.1 2.2 2.3 Dooley A.197-A.200. ↑ 8.0 8.1 8.2 8.3 8.4 8.5 8.6 8.7 Robinson 1973, p.331. ↑ Janes's Pocket Book 7, Airship Development, p82. ↑ Robinson 1973, pp. 152-3. ↑ Robinson 1973, p. 333. ↑ 33.0 33.1 Rimmel. 1916 L 11 crew photo – first photo shows Viktor Schütze was Korvettenkäpitan; of the L 48 crew only Otto Meith (died 30 April 1956) and Heinrich Ellerkamm (died 4 August 1963) eventually survived; Wilhelm Uecker died later from complications and influenza on 11 November 1918. Second photo shows British military salvage team posing in front of the wrecked L 48, note erroneous writing. ↑ Robinson 1973, p. 105. ↑ 38.0 38.1 38.2 Robinson 1973, p.334. ↑ Robinson 1973 p. 113. ↑ Flieger und Luftschiffer – Quirin Gerstl. (In German) the platform observer recollects its first attack on England during which L 34 was lost in flames, and later the loss of L 24. ↑ Thetford 1978, p. 86. Bruce, J.M. The Sopwith Pup: Historic Military Aircraft No 6. Flight. 1 January 1954. p. 8-12. Rimmell, Ray; Preston, Tony. PAST ZEPPELIN L48 PHOTO OF THE MONTH. Theberton and Eastbridge Parish Council. 2008-07-27. URL:http://www.onesuffolk.co.uk/NR/rdonlyres/4EA8A481-F0DE-429A-B9AB-C0A0480FC99A/152695/Z1.doc. Retrieved 2008-07-27. (Archived by WebCite at http://www.webcitation.org/5ZdBiUBed) (Word document) from The Last Flight of the L48, linked from Theberton and Eastbridge Parish Council History. Thetford, Owen. British Naval Aircraft since 1912. London: Putnam, Fourth edition, 1978. ISBN 0-370-30021-1. This photograph on 19 March 1918 shows 32 crew with Kapitänleutnant Friemel. Selected L 52 crew photographs: , , ,  and . This page was last modified on 7 May 2016, at 16:57.